The Cow Neck Peninsula Historical Society is dedicated to keeping the rich history of the area alive. 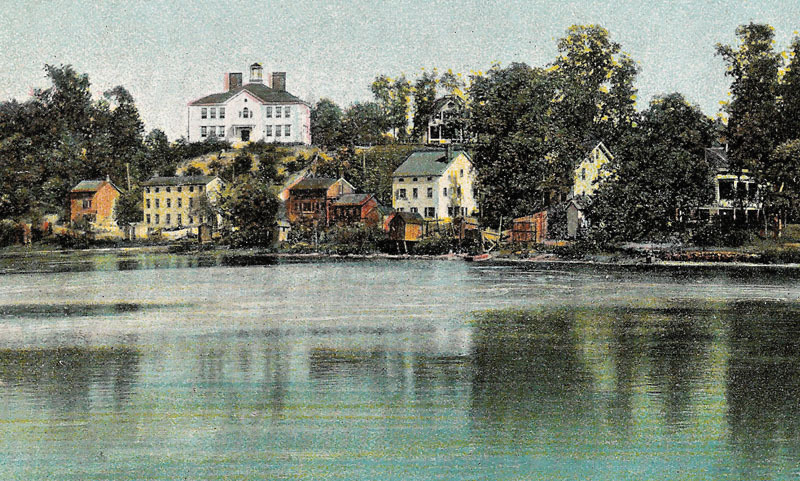 Originally known as Cow Neck, the region was later developed into Manhasset, Port Washington and Sands Point. Before the addition of the Long Island Rail Road in 1898, the shoreline was the center of town and the Hotel Renwick, which is the same building Diwan Restaurant currently occupies, greeted passengers and gave them a place to stay. Recorded history of Cow Bay reaches back centuries, with settlers first landing in 1643. It was originally part of Hempstead, along with all towns currently part of Hempstead and North Hempstead—but on September 23, 1775, almost one year before the signing of the Declaration of Independence, farmers of Great Neck and Cow Neck declared their independence from Hempstead. One-room “Down-Neck Schoolhouse” was located at the back of the Mill Pond, across from the Dodge Homestead. It is now Pleasant Avenue. The document was signed by John Farmer, clerk of the meeting. Some Great Neck and Cow Neck patriots listed on the document include John Burtis, John Cornwell, W. Cornwell, Thomas Dodge, Adrian Onderdonk (who would become the first Town Supervisor of North Hempstead), Benjamin Sands, Simon Sands, Martin Schenck (treasurer of Queens County in 1786 and 1792) and William Thorne. The names are prevalent throughout the villages and are prominent street names and landmarks. 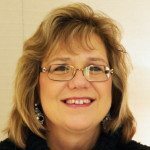 The mission of the volunteer-run historical society is to engage people of all ages in programs that highlight the lifestyles of the people and families that lived and worked on the peninsula throughout the years. Central to its mission is the preservation of the Sands-Willets House (c. 1735) and the Thomas Dodge Homestead (c. 1721), which the society operates as house-museums. The second Flower Hill School (1869-1924) is now occupied by the Port Washington Police Station. According to the Cow Neck Peninsula Historical Society, historical society president Christopher Bain and Glen DeSalvo documented the evolution of the Port Washington school system. 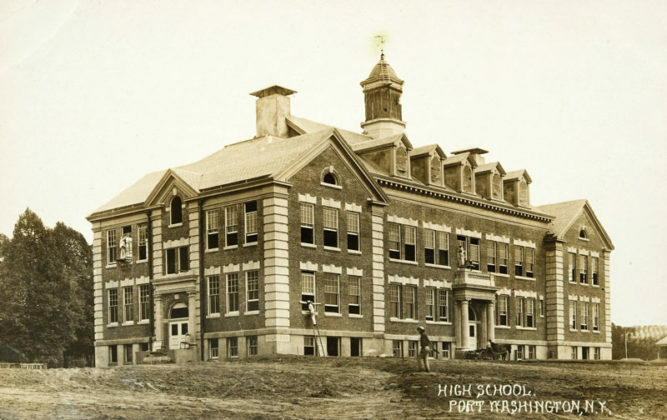 In 1869, Port was already outgrowing its two small schools. 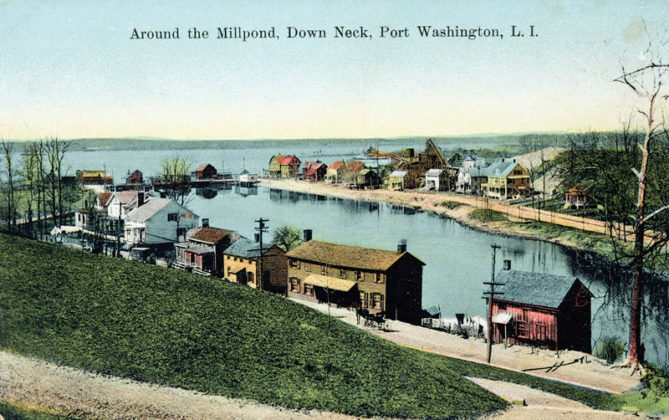 The area within Cow Neck was divided into two separate districts: The Bottom of the Neck—or Down-Neck, designated as School District 5, which encompassed the businesses centered near the Mill Pond, including the Grist Mill and McKee’s General Store. 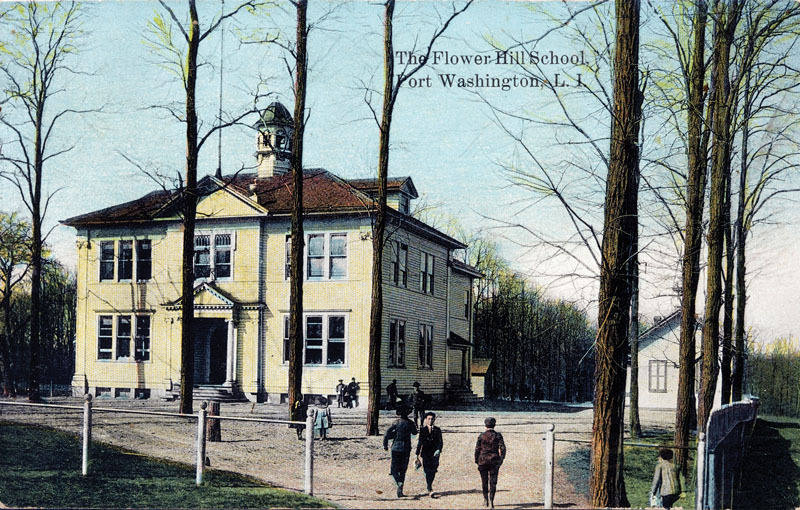 School District Number 4 was referred to as Flower Hill and was comprised mostly of orchards and farmland that extended south to the head of Cow Neck (Manhasset) district. Locally this was known as Up-Neck. 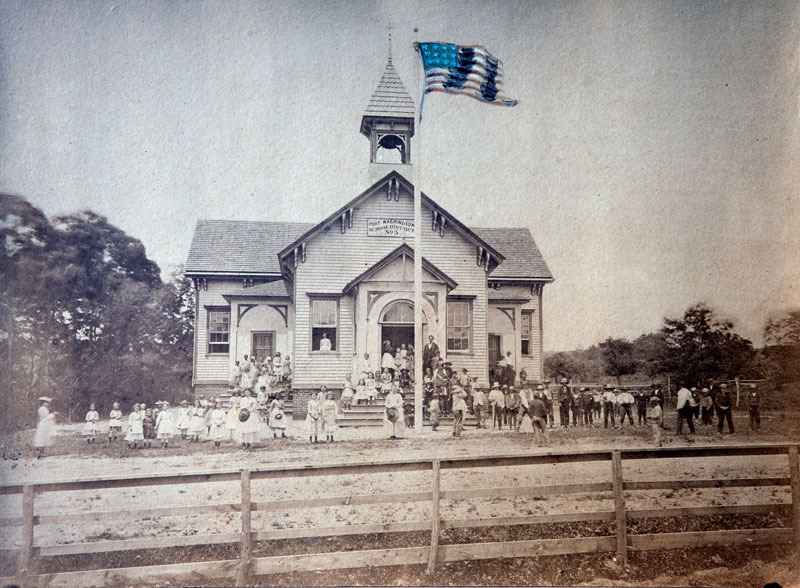 This is the first known photograph of a Port Washington school, probably photographed in the 1870s. The structure has been moved and greatly renovated, but is still at the end of School Street. 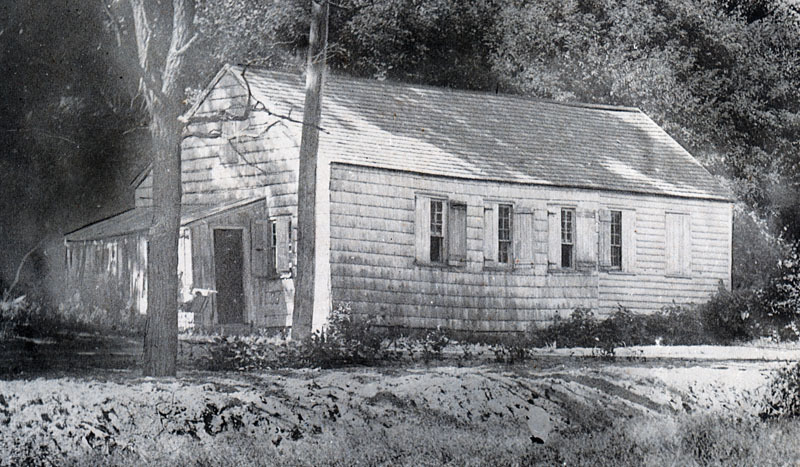 Cow Neck’s Up-Neckers had a small one-room schoolhouse at the bottom of present-day Bogart Avenue, built in about 1757, though records are scarce. 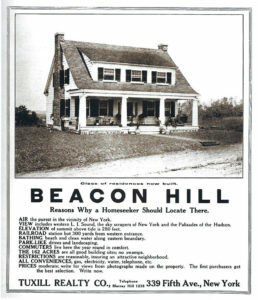 It was sometimes referred to as the first Flower Hill School. By 1841, the Down-Neckers had their own one-room schoolhouse near the back of the Mill Pond, opposite the Dodge Homestead, at the bottom of today’s Pleasant Avenue; both had become insufficient for the growing village. 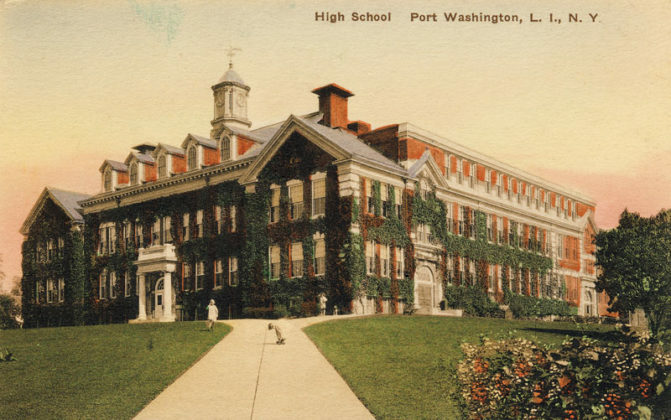 By 1869, the two local school districts of Port Washington needed larger, more modern schools. 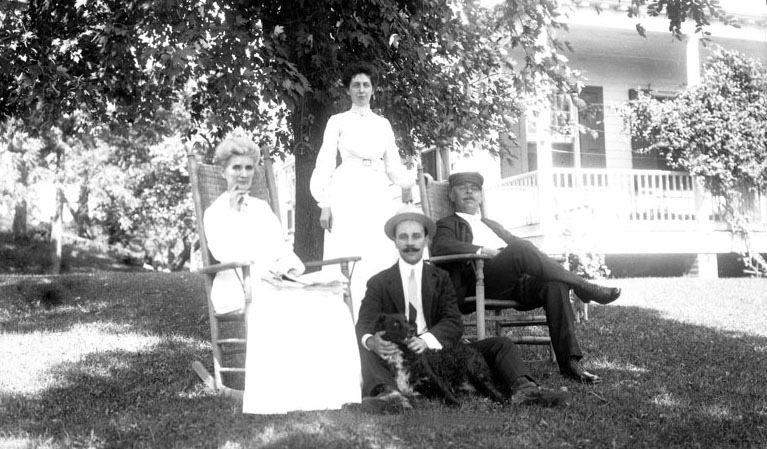 In the Up-Neck section, property was purchased from the Onderdonk family, who had extensive land holdings in town. 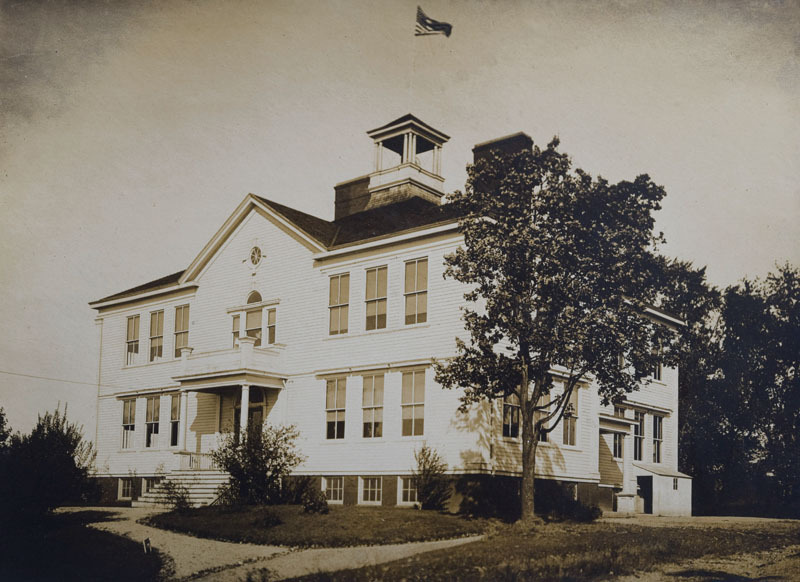 By summer’s end, a new two-room schoolhouse was built and named the Flower Hill School, sitting where the present day Port Washington Police Station is located. By the end of the century, with the population swelling to 1,200, several additional rooms and a second floor were added. A view from the Sands Point School No. 2, probably photographed by John Witmer, overlooking the Mill Pond out toward Manhasset Bay. Sands Point School No. 2, in a very rare close-up photograph. Main Street School, under construction in May, 1909, shown from the corner of the property closest to today’s public library. The school served the community for more than 75 years and is still going strong as Landmark on Main Street. Main Street School in the mid-1920s, showing the 1917 extension, which doubled the size of the school. Sadly, after more than five decades of educating the youth, the little schoolhouse succumbed to a fire. According to former school superintendent Paul D. Schreiber, the janitor, William Allen, had been burning refuse when the fire got out of control and ignited some nearby kerosene, burning the building beyond repair on June 24, 1924. In 1870, at the back of the Mill Pond, the little red school house was deemed too small to serve the growing population of Down-Neckers. After contentious negotiations with the landowners and at a cost of $6,000, a new schoolhouse was built on School Street. On August 24, 1870, the entire town came out to celebrate the dedication of The Green Schoolhouse, or the Sands Point School. The town was growing rapidly and with the Long Island Rail Road pulling into Port Washington in 1898, people could easily commute to New York City. 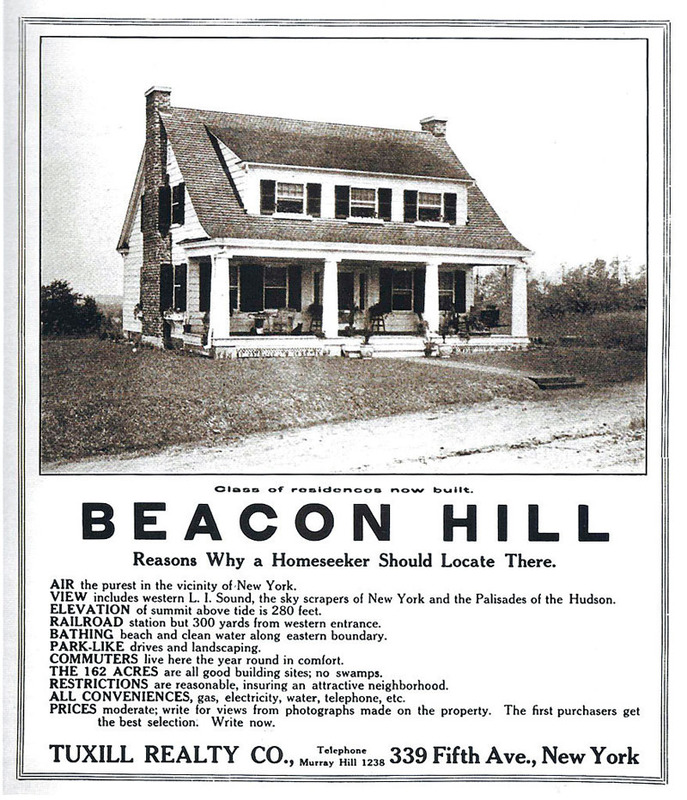 New homes were being built and neighborhoods planned at a breakneck pace. The town needed a bigger, more centralized school and a high school was the answer. Several locations were considered, but the Webb family farm provided the perfect location, at the intersection of Main Street (still named Flower Hill Avenue until 1912) and South Washington Avenue. Money was raised and in 1908, the Webb house was bought, split into sections and moved to two side-by-side lots on nearby Jefferson Street. Local architect Frank Cornell designed the beautiful Beaux Arts building and local contractors Smull & Walsh were hired to build what would become known as Main Street School. The opening day festivities on September 17, 1909, were the biggest celebration the townspeople had ever witnessed. Seven years later, the demand outpaced capacity and the size of the school needed to be doubled. This fall, The Cow Neck Peninsula Historical Society will hold its Fall Country Fair on Saturday, October 14, at the Sands-Willets House. For more details on this and other events or to donate, visit www.cowneck.org.